Welcome to the S&S Boer Goat Farm. Our little farm is owned and operated by Steve and Sherry Ruck. 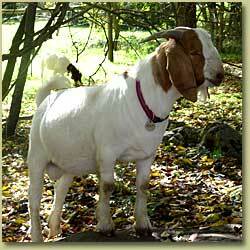 Our goal is to raise quality boer goats for breeding or showing. Our focus is on raising healthy people-friendly 100% boer goats. WE HAVE NOW ADDED TARZAN T66 BLOODLINE TO OUR HERD. Contact us for price and availability of our goats for sale. SAM - 8 Months - 150 lbs. Copyright © All rights reserved by S&S Boer Goat Farm.